All you need to know about the IPL 2019 Sunrisers Hyderabad team. Having released 4 players before the auctions, last year’s finalists Sunrisers Hyderabad went into the player pick knowing they just needed to fill in the holes. Having a total of 5 slots to paper over, the side under Kane Williamson’s leadership went about snatching up a total of 3 players at the auction window with Bairstow, Saha, and Guptill coming into their side. Making it all the way into last year’s summit clash, SRH will go into IPL 2019 as one of the most complete and well-balanced sides. The return of Warner from his one year ban along with Kane Williamson and newly purchased Guptill at the top, not only consolidates an already menacing batting line-up but with Pathan and Saha to follow up in the middle-order, it’s a unit that can easily take apart any bowling unit. In Bhuvneshwar and Rashid Khan, the bowling department makes for an equally compelling showing, with two specialists who are more than able to single handily win the matches. However, right before the commencement of the new season, the SRH unit has seen a huge setback hit them with Captain Kane Willamson suffering a pectoral minor tear in the second test match between New Zealand and Bangladesh. With the world cup beckoning two months later and Williamson one of the most pivotal players in his country’s setup, the New Zealand cricket board might be considering giving him a rest for the T20 tournament in order to keep him fit ahead of the all-important international showpiece tournament. Although no confirmed news has come as yet on the issue, if Williamson misses out for SRH it will come as an irreplaceable blow to the side that saw Williamson step up and become the fulcrum of their side for last season. The orange cap winner for IPL 2018 not only delivered some dazzling performances but his expertise in the captaincy department ensured that the franchise went all the way in the 11th season. Elsewhere though, SRH has little issues that will concern them. An outfit that has kept its main unit intact ahead of the upcoming season had a clear game plan ahead of the auctions. In dire need of a wicket-keeper, they brought in Saha and Guptill for both of their base prices. The last buy came in Bairstow at Rs.2.2 crores, taking the sides overall spending to Rs.4.4 crore, seeing them go into the season with a 23 man squad, sparing Rs. 5.3 crore of their transfer budget. The side was also majorly active in the preceding midseason, trading in three of their players with their counterparts. The most surprising trade came in with them letting go of their opener Dhawan who went to the revamped Delhi Capitals in place of Shankar. Abhishek Sharma and Shahbaz Nadeem were the rest of the traded in players that the side managed to get in, helping strengthen their fringe players’ quota and putting them as one of the frontrunners ahead of the new season. SRH will play their first match of the season on March 24 against KKR and ahead of the 12th instalment; the side has come out with a lucrative offer for their supporters. The franchise has announced that it will open 25,000 seats at their home venue for their matches and tickets will be available for only Rs 500. 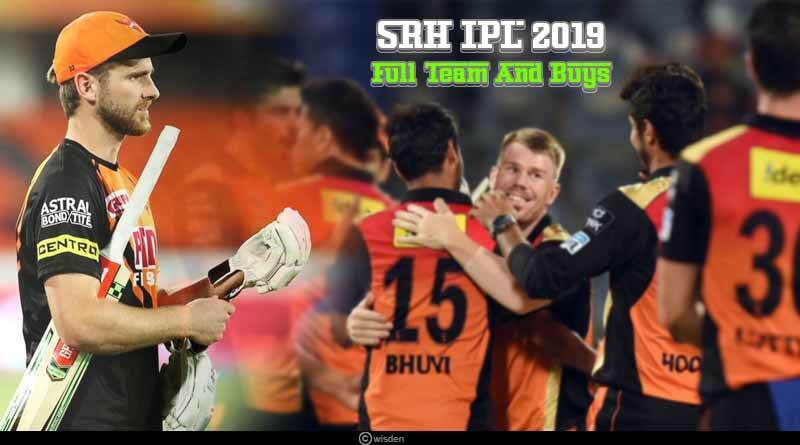 For more articles like ‘IPL 2019 Sunrisers Hyderabad team’, do follow us on Facebook, Twitter, and Instagram.